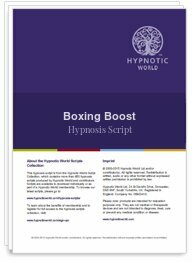 If you want to be a better boxer then look no further than this Boxing Boost hypnosis script download from Hypnotic World. More and more sports personalities are turning to hypnosis to improve their, focus, concentration and physical ability. It stands to reason that if you believe that you can do something well then you have far more chance of succeeding. Your subconscious mind helps you to efficiently carry out all the tasks that you don't actually think about. For example if you are dialling a phone number that you've used many times before you will probably know it off by heart - but and this is a big but - if you stop and think about it your conscious mind interferes and makes you hesitant. It is the same sort of principle with many sports. Hypnosis helps by allowing you to integrate the knowledge of the game and a belief in yourself and your ability into the subconscious part of your mind.